Are You Responsible For The Outcome Of The Election? : 13.7: Cosmos And Culture What does one vote matter, your vote? Clearly the election is not going to turn on your individual action. So where does the motivation come from to get up out of your chair and head to the polling station? Commentator Tania Lombrozo digs into the psychology of our decision to vote, or not. 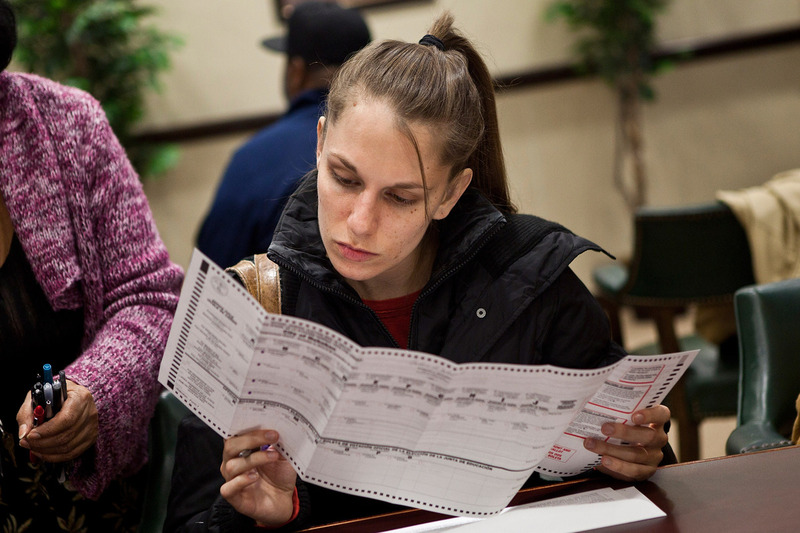 A voter fills out a ballot Sunday in Jersey City, New Jersey. Gov. Chris Christie ordered early-voting stations to stay open through the weekend. We've all heard arguments that go something like this: it's not rational to vote, because the probability that your vote will make a difference is vanishingly small. This idea is formalized as "the paradox of not voting," and follows from a simple application of rational-choice theory. But whether you vote might have more to do with subtle and interesting aspects of human psychology — the niggling feeling that you're ever so slightly responsible for the outcome of the election — than with a rational analysis of costs and benefits. First, a closer look at the paradox. If you're a rational agent who votes in order to influence the outcome of the election, then the small costs associated with voting — the five-minute trek to your local polling place, the interruption to your workday, or even the hassle of remembering to mail in your absentee ballot — should be enough to outweigh the miniscule probability that your vote will change the outcome of the election (what FiveThirtyEight calls your "return on investment" as a voter). But this argument rests on some assumptions that may not hold true. Perhaps voting serves ends other than influencing the outcome of the election, such as promoting civic engagement, or propagating those handsome "I voted" stickers. Or perhaps it would be so irredeemably terrible if your preferred candidate lost that you'll happily brave the walk and the lines and the interruption to your day despite the infinitesimal probability that your vote will change the outcome — a Pascal's wager, of sorts. There may be something to these ideas. But I think there are also psychological forces that drive us to the ballot box, forces that stem from the way we attribute responsibility. Let's back up a step. To assess the probability of casting a deciding vote, we compare two possible worlds. In one world, you vote along with other voters, casting your ballot for your preferred candidate. In the alternative world, you relax at home with a soy latte and your radio tuned to NPR while everyone else does exactly what they did in the first world: the voters vote and the non-voters don't vote. The only difference between these worlds is you. To assess whether or not your vote "made a difference," we compare these two worlds to see whether the election has a different outcome in each one. This criterion for "making a difference" is reasonable in some cases. But it doesn't correspond to the way we typically assign causal or moral responsibility. Consider an execution in which three renegade soldiers simultaneously and fatally shoot an unfortunate victim in the heart. No single soldier's actions made a difference to the resulting death: if we "undo" the actions of any one soldier while holding everything else fixed, then the death would still have occurred in just the way it did. Yet most of us won't hesitate to hold each soldier responsible. One way to make sense of cases like these is to propose that responsibility is a matter of a person's intentions and actions, not of the outcomes of those actions. But this idea won't do: we don't treat attempted murder as equivalent to actual murder, or a successfully executed touchdown pass as equivalent to one that — by no fault of the thrower — was intercepted. So how do we assign moral and causal responsibility for outcomes that result from the actions of multiple people? And what can this tell us about the paradox of not voting? Some recent ideas about causation and moral judgment from computer science, philosophy and psychology shed interesting light on the first question. The basic idea is this: that we don't assess whether someone is responsible for some outcome by comparing what actually happened to a fictional world in which everything other than the actions of that person are held fixed, but instead figure out how different the world would have to have been for the actions in question to have made a difference; where the more different the world, the less responsible the person. That's pretty abstract, so let's return to our unfortunate shooting victim. Even though each individual soldier doesn't make a difference to the outcome when we hold the actions of the other two soldiers fixed, it isn't hard to imagine an alternative world in which we also change the actions of soldiers #2 and #3. And in that world, soldier #1 would make a difference to the outcome. So we judge soldier #1 moderately responsible — not as responsible as a lone shooter, but more responsible than any single member of a 10-person firing squad. Researchers Zultan, Gerstenberg and Lagnado tested these ideas in a paper published earlier this year and found a good fit to human judgments. Applied to voting, their findings suggest that people's judgments of responsibility don't involve a straightforward "same or different" comparison between the election outcomes in the world where a given person voted and the world in which she enjoyed a soy latte at home. Instead, people consider how different the world would have to have been for the non-voter's abstention to have made a difference. Because we can typically imagine a possible world in which her vote was the deciding vote — after all, if she chose a latte over voting, why not other like-minded voters, too? — we still hold the non-voter somewhat responsible for the outcome of the election, even if her abstention didn't, strictly speaking, "make a difference." But it needn't follow that we hold individual non-voters (or voters, for that matter) highly responsible for the outcome of the election. Zultan, Gerstenberg, and Lagnado also found that individuals were held less responsible for outcomes when other people could have played a role equivalent to theirs, and that's certainly the case in presidential elections, where voters for the same candidate in a given state are effectively interchangeable. Still, these ideas can help explain why someone might feel at least a little bit responsible for the outcome of an election, and therefore hazard the minor costs of voting knowing full well that their vote won't change the outcome. That feeling of responsibility, however small, could be magnified by the sense that choosing not to vote is tempting fate, a worry known to boost people's estimates of the probability that the undesirable outcome will occur — in this case, your preferred candidate losing. Of course, psychological explanation is no substitute for rational justification. But you'll still find this voter heading to her local polling place tomorrow morning.